Republican Ling-Ling Chang currently represents Assembly District 55. Chang is running for State Senate in 2016 and will give up this seat, making it an open seat. This seat is expected to remain Republican. Ling Ling Chang was elected to the State Assembly in November of 2014 and first elected to the Diamond Bar City Council in November 2009. She served as the Mayor of Diamond Bar from 2011-2012. Councilwoman Chang has served as the City Council delegate to the League of California Cities - Los Angeles County Division, of which she was elected President, and the Southern California Association of Governments. She also serves as a member of the Countywide Criminal Justice Coordination Committee. 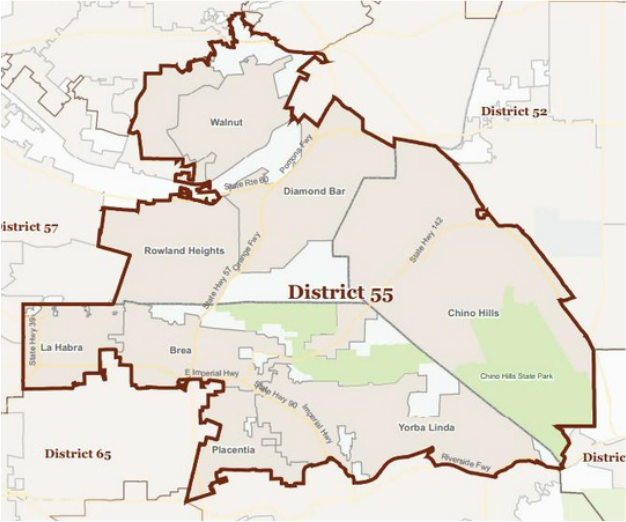 Before joining Council, Chang’s record of public service included serving as an elected Board member and former President of the Walnut Valley Water District Board of Directors from 2005 to 2009, and the Diamond Bar Parks & Recreation Commission from February 2004 to February 2006. Chang was also a gubernatorial appointee to the California Board of Vocational Nursing and Psychiatric Technicians (BVNPT). Ling Ling Chang was most recently President & CEO of the Youth Science Center, a non-profit science education organization that focuses on STEM (Science, Technology, Engineering and Math) education. Previously, she served as Executive Director of the United Family Services Center, a health and human services agency, where she focused on public health/health policy. Before entering the non-profit sector, she worked in the corporate sector at a health information systems firm as a project manager helping develop software products for the health information management/clinical documentation industry; as well as consulting and training physicians, system administrators, directors, and medical staff at various hospitals across Southern California. Assemblywoman Chang also serves on the Board of Cal Poly Pomona Partners-in-Education, and had served on the prestigious National Development Council at Cal Poly Pomona. She also serves on the US Army Los Angeles Advisory Board and is a National Fellows Alumnus with the Asian Pacific American Women's Leadership Institute. Chang has been formally recognized by the State of California, the State Legislature, various cities across the state, Los Angeles County Board of Supervisors, YWCA, local school districts, and many other organizations. She was also chosen as the 60th Assembly District’s Woman of the Year in 2006. Ling Ling and her husband Andrew currently reside in Diamond Bar.